Offering you a complete choice of products which include Toyota Corolla For Rent, Tata Indica For Rent, Honda City For Rent, Toyota Innova for Rent, Toyota Fortuner for Rent and Tata Indigo For Rent. We offer Toyota Corolla on rental basis for various tours as well as corporate visits. This Toyota Corolla is in a well maintained condition and can easily accommodate 4-5 people. Spacious as well as comfortable this is provided with AC as well as Non AC according to the clients demand. It will comes in luxury car rental. Packaging Details: Luxury Tourist Taxi Services for Chandigarh, Rajasthan, Haryana, Uttar Pradesh, Uttarakhand, Punjab, Himachal Pradesh, Leh, Jammu & Kashmir. We also offer Tata Indica for rental purpose. Our cab can easily accommodate 3-4 people and is fitted with AC for hot summers. With proper seats having backrest this car is smooth and also has a powerful engine that makes the car move even on the rough roads. We take clients budget into consideration and then accordingly provide with the travel services. 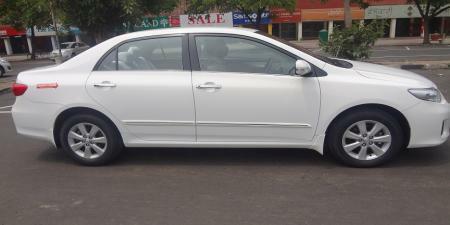 We offer Toyota Corolla on rental basis for various tours as well as corporate visits. This Toyota Corolla is in a well maintained condition and can easily accommodate 4-5 people. Spacious as well as comfortable this is provided with AC as well as Non AC according to the clients demand. It will comes in luxury car rental. We provide complete A/C Lancer to be hired on rent. It is comfortable and most convenient to use. Important features of it are: 4+1 seat in. We have this car rental agency in india. A perfect family car this is a blend of new innovations in the automobile sector. Its elegant design, comfortable seats and wide space makes it the most preferred one for various events and seminars. Smooth on every kind of road it contains integrated rear blowers that allow better ventilation even at the back of the car. Toyota innova for rent is available in our indian car rental agency. We provide Toyota Innova on Rent for North India Tourist Places for Business & Vacation Travel. We provide complete AC Tavera on rental basis. Comfortable and most convenient to use it can easily accommodate 7 people and also gives high mileage. Equipped with rollover ratings and crash test figures this Tavera is also available in various colors to choose from. With a displacement of 1500 cc this Tata Indigo is available in various exotic colors and is also highly spacious. This Tata Indigo is not only affordable and within the clients budget but also gives a good output. It has high shock absorbing capacity and can run smoothly on even the toughest roads. For trouble free tour and travel we offer Honda Accord with reliable, safe and attractive interior along with eye catching exterior. With a seating capacity of 4-5 people it ensures a safe and luxurious driving. We also have experienced chauffeurs to drive these cars who are well versed with all the traffic safety norms.